We’ve had a stunning summer for the most part. Lots of sun and just the right amount of heat. In the last couple of weeks though, we’ve had a bit of rain here and there. 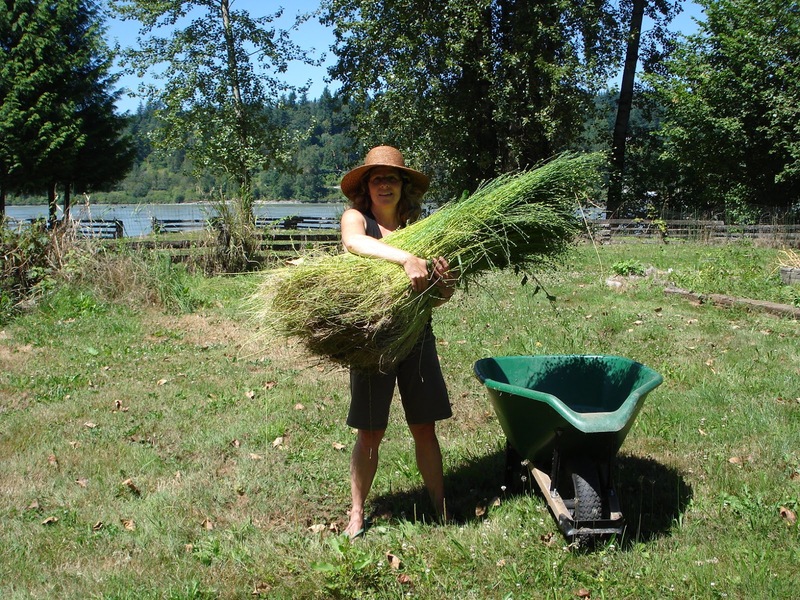 Good for the corn and the hay, but not for flax that you’re drying. 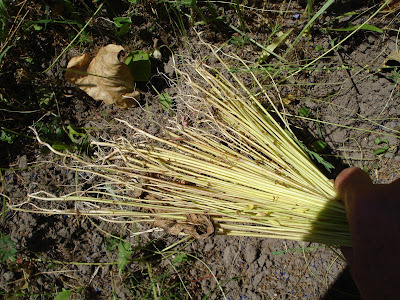 The harvested flax from the bed #1 and #2 were mostly dried and I finished it off by keeping it under cover. I was getting pretty tired of moving the stuff around, onto the lawn when the sun was out, back on the porch for overnight or if a rain cloud came by. When it was finally dried I decided it was time to ripple it. Rippling flax is the process you us to remove the seed pods. Last year when I did this I was so excited and learning as I went along. This time, I knew what I was in for. It’s a dusty, dry job and very messy with all the seed pods flying everywhere. So I did my best to minimize that. I swept the back porch carefully.Then I put a white sheet over the work area, the railing and let it hang onto the floor. The plan was to catch as many seed pods as possible. Then I set up the rippling contraption that I bought in the spring from a local antique/junk shop. Right next to it I set up the Russian paddle comb that I used last year for rippling. I wasn’t sure how the green thing would perform and I knew the paddle comb worked. Here I am about half way through the process. This is the dried flax with the seed pods and dried leaves still on them. 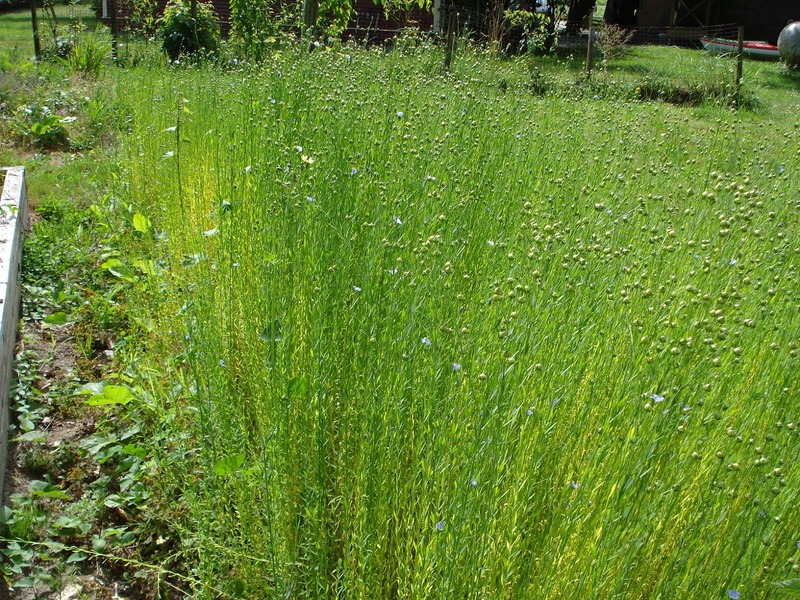 The variety of flax that I grew this year is the true Linum usitatissiumum linen variety. 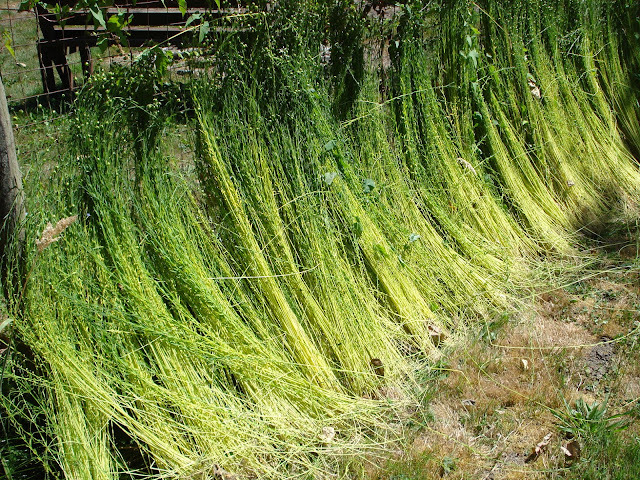 It’s nearly twice as long as the flax seed variety that I grew last year. Not only is it twice as long, the stalks are larger and tougher. Here’s a small bundle of it going through the rippling tool. This one worked well for the first passes and then I used the Russian paddle comb to finish up. Used together I was able to clean up all the seed pods and dried leaves. After a bundle was cleaned up, I tossed it to the side and then grabbed another bundle. Here’s what a cleaned up couple of bundles looks like. And here’s the whole lot of it from bed #1 and #2, rippled and waiting to be retted. Retting is the process of rotting the outer layer of pectin to release the linen fibres from the straw. I can dew ret which is to let the morning dew and rains melt it away. Or I can wet ret it by putting it a shallow pool of water and try to replicate an eddy next to a slow moving stream. I prefer the lighter colour you get from wet retting so I’m going to toss this into a kiddie pool. Right now it’s carefully wrapped up and under cover of the shed. I have two more beds to harvest, will probably do that over the weekend as we are expecting sun and heat. That will give the flax a good start on drying. Then another rippling marathon and then. 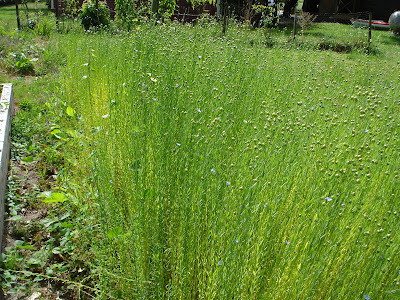 . . . . what on earth am I going to do with all this flax? Adventures with flax to linen continued. 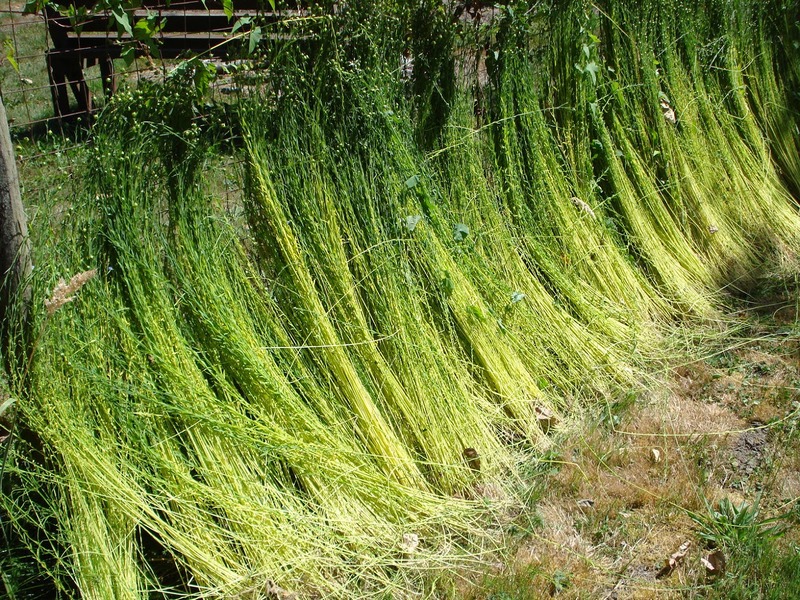 This entry was posted in flax, rippling flax on August 31, 2013 by DianaTwiss.